I have always been fascinated by the art of cake making. It has been something I have wanted to try for a long time but have never mustered up the courage to attempt. The truth is fondant scares me, I have long admired and pinned different cake & cookie creations that I have found, on Pinterest but have also read about the horrors of working with fondant. My daughter’s second birthday is nearing and I really wanted to make her an amazing cake, so it is time to get over my fears. I wanted to start with something simple for my first time around, so keeping with the theme of the season, I went with a pumpkin. I opted to use store bought cake mixes for my experiment. Don’t judge me! I’m not much of a baker. Step 1. 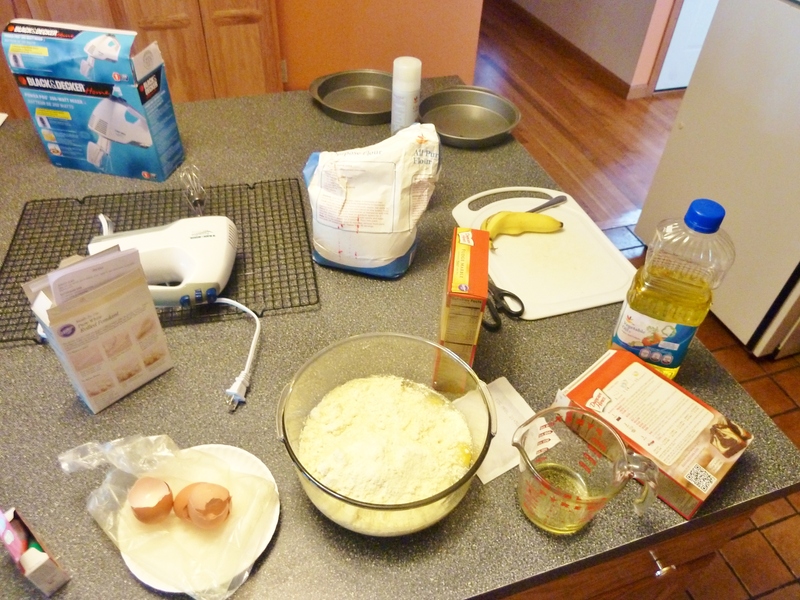 Prepare cake mixes. 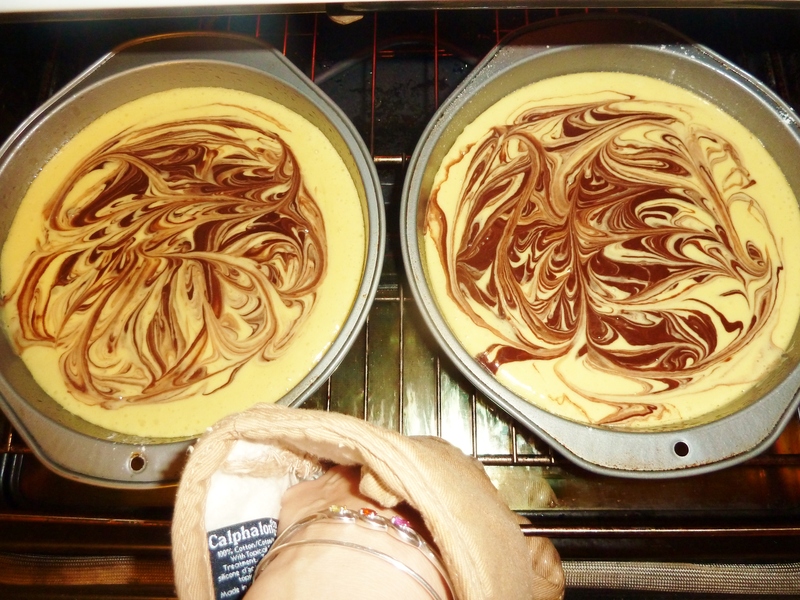 I used three boxes of marble cake mix. I waited for my daughter to take a nap before I got started on my project. She is such a light sleeper. Her bedroom is just down the hall from the kitchen and I did not want to run the risk of waking her, so I took my electric mixer and cake mix outside to plug into the porch outlet to prepare my batter. I am a messy baker. Step 2. Pour in cake pans. 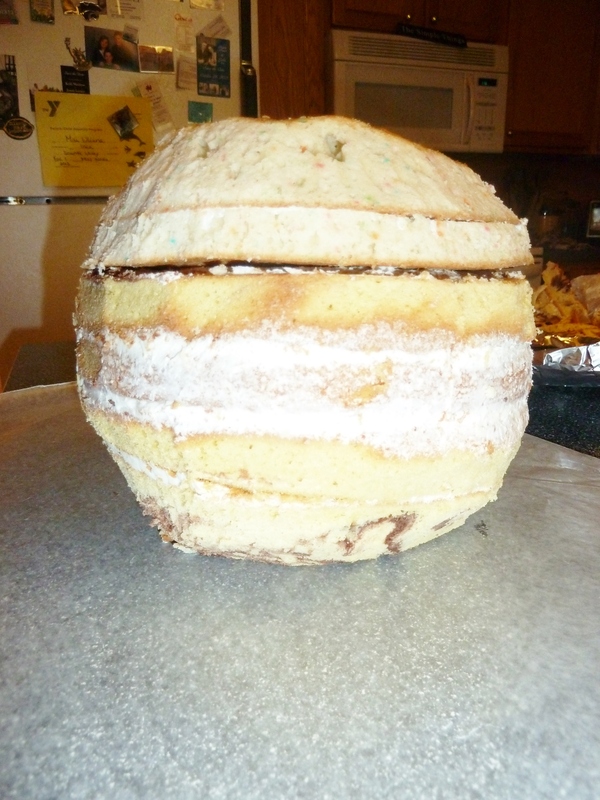 I used 2 9″ round cake pans for each boxed mix. They do sell global shaped cake molds but because as I was looking for a simple project to practice cake carving with I opted to layer and carve the cakes instead. Step 3. Cool. 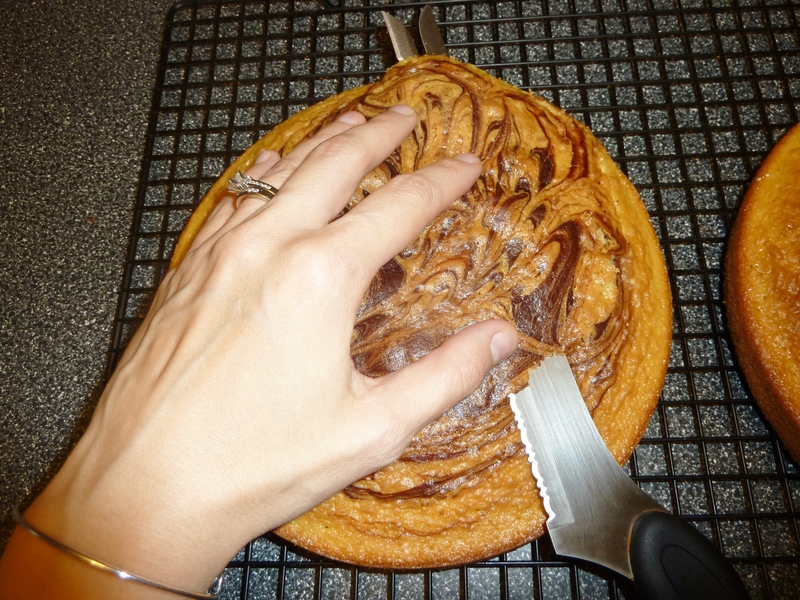 Carve excess cake off the top for even layering. Step 4. Layer the cakes on top of one another using frosting or icing between layers. Step 5. Freeze the cake. I found this tip on http://cakedecorating.about.com/od/Constructingthecake/a/Cake-Carving-Tips.htm. I always had wondered how they were able to create those designs without the cake crumbling apart. I froze mine overnight. Step 6. Cake carving time. Step 7. Frost the cake. This ensures that the fondant will stick. It suggests using icing instead of frosting because frosting is too slippery of a surface to adhere to, but since I had a few unused containers I opted for the frosting. I did it in a thin layer and then refrigerated it so that it would harden slightly. Step 8. 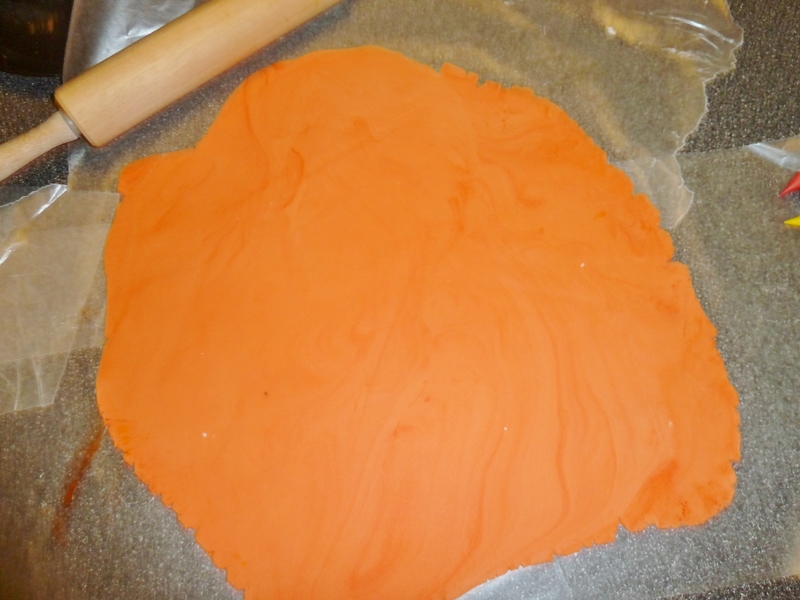 Knead your fondant & add food coloring. I used the Wilton’s rolled fondant. It is very hard but after alot of kneading it does soften. 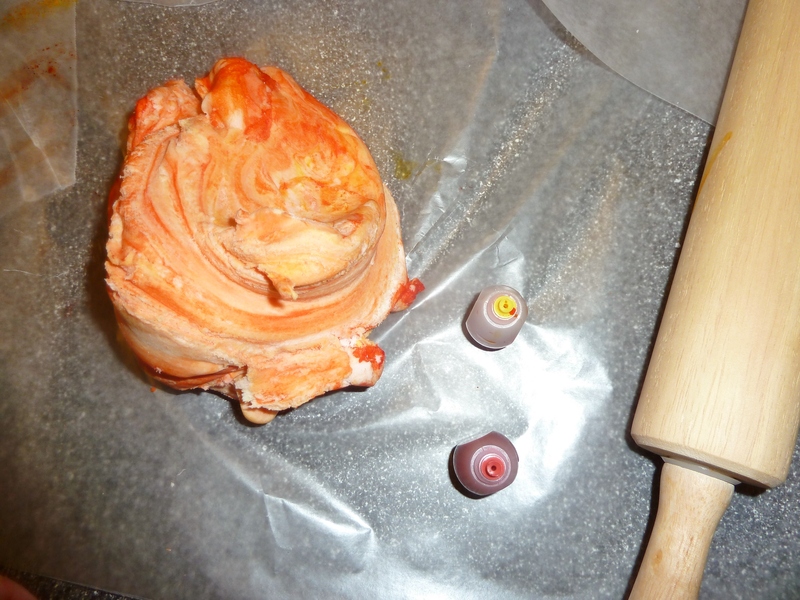 Add food coloring a drop at a time to achieve your desired color. Step 10. Now this part was tricky. Apply the fondant. I did have a difficult time doing this. 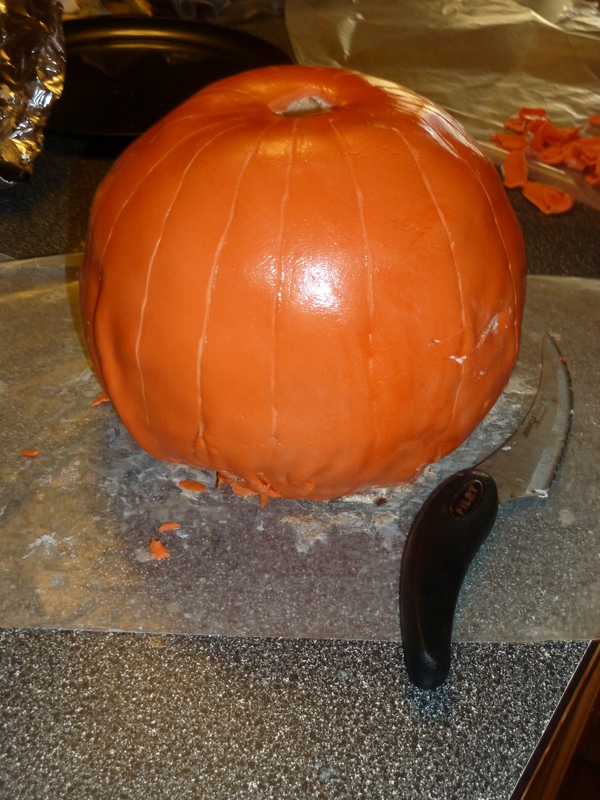 Be careful when smoothing your fondant down to the bottom. You must quickly maneuver and stretch it so that it does not form creases. 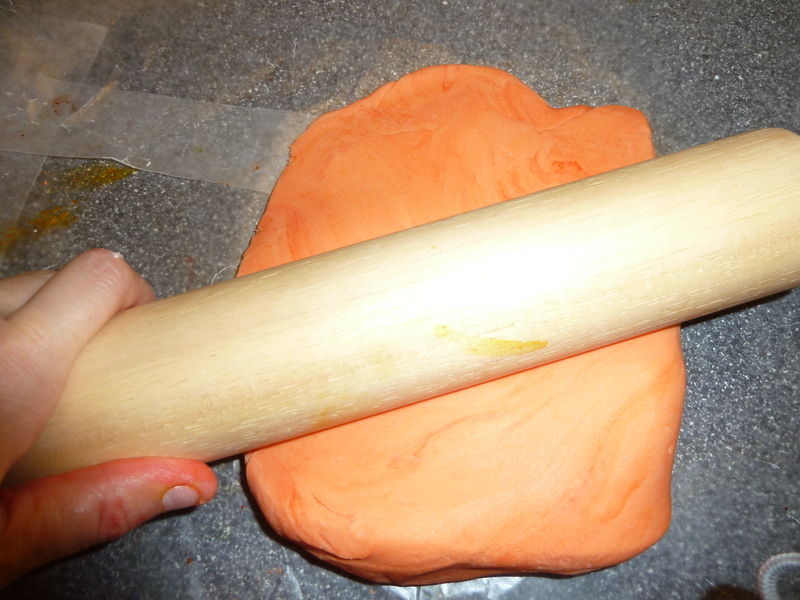 Slice off any excess fondant that is pooling around the bottom. If you have any rough spots or tears, rub a little bit of oil on the area and smooth it out. Step 11. 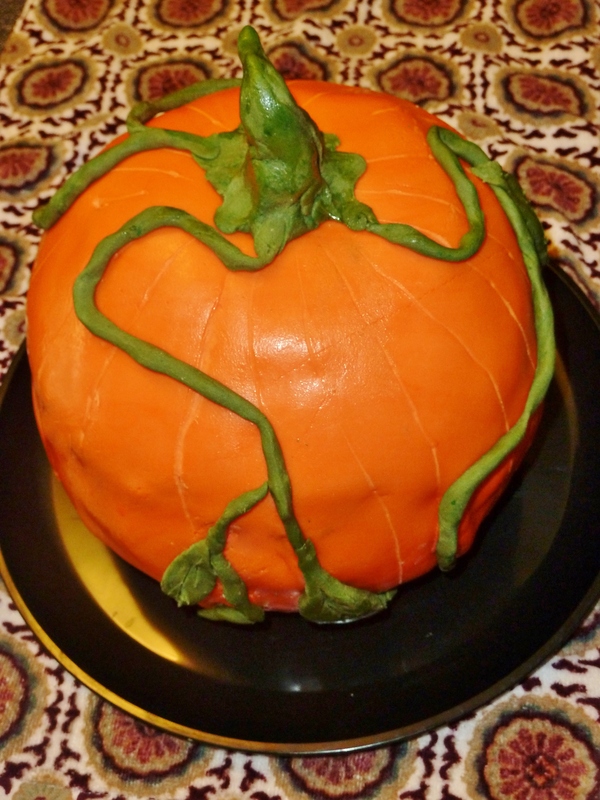 Use excess fondant to make vines and leaves for your pumpkin. I had to add more food coloring to achieve the green. This is where you can cover up any flaws you may have. I was able to hide a lot of my mistakes with the vines and leaves. Step 12 Admire your finished product. It is not perfect but I thought it was a noble first attempt. Thanks for your post! I’ve yet to try fondant out, still building up the courage! Your welcome. It took me a while before I was brave enough to try it. I am eager to work with again. I see many cakes being baked in my future. Good for you! Keep it up 🙂 Your first attempt was beautiful, your next ones will be too! Reblogged this on Lil' M & Me.